I had the occasion to be in Reno today. Took a walk with a friend of mine, and we happened upon the Burger Me truck, outside the Hub coffee shop by the river. 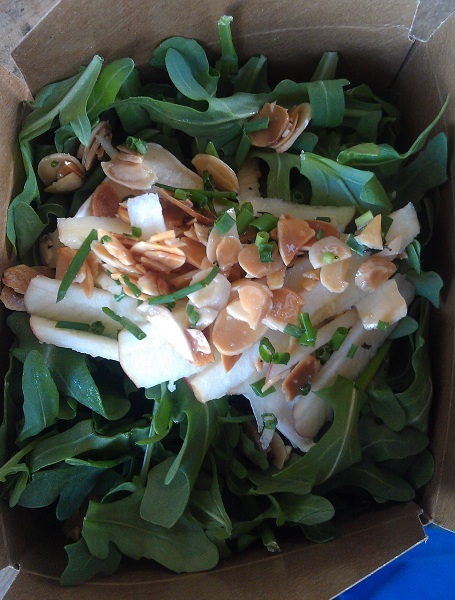 Since it was lunchtime and it looked good, we gave it a try. 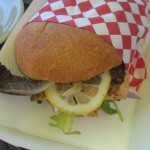 F irst, I was delighted to find they didn’t just have burgers – I had the “salmon burger” with a beautiful and perfectly cooked filet of salmon, served with mixed greens, goat cheese, dill, and super-thin slices of lemon. My friend Marjorie had the Ahi burger with an equally perfect filet of ahi served with delicious wasabi sauce and cabbage. It was so good she offered me a bite and then thought better of it – but here’s a picture, and from the way the conversation came to a halt, it was really that good! Look, Reno’s not a place I’d visit if I had a choice, but, if you have to go, this truck may be the only place I can recommend. We had a perfectly lovely lunch, sitting in the late summer sunshine next to the Truckee River. 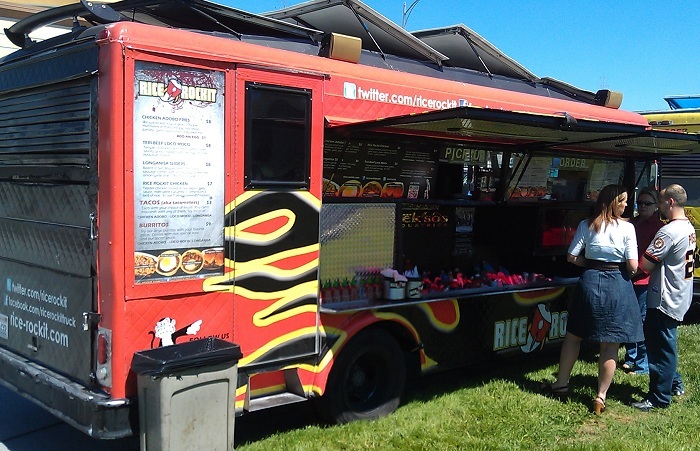 I have visited the RiceRockit truck twice now; once a few months back at an event in San Jose, then again just a couple of days ago in Sunnyvale. The first time I had my friend Trisha along. 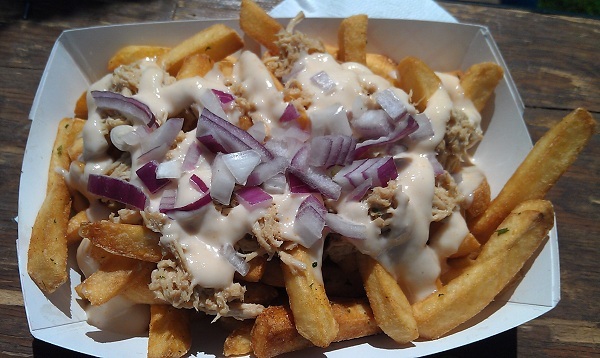 They had a vegetarian special “RiceRockit burrito,” and she had the Chicken Adobo Fries. 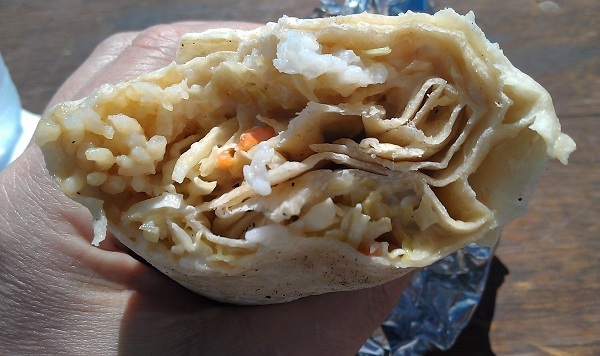 I actually enjoyed the rice burrito – it was pretty simple and kind of plain, but the rice was good (as you’d hope) and it came with a good sauce and some veggies. 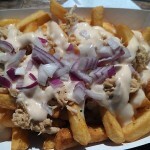 Trisha’s fries were certainly good: heaped with flaked chicken and “adobo” sauce (it wasn’t really, but it was tasty). She enjoyed them, even though she thought it should have been spicier. All in all, both dishes were pretty good, but not enough to cause us to run back. 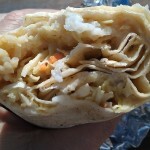 The other day I found myself in Sunnyvale after a doctor visit, and Rice Rockit was nearby. I thought it was a nice opportunity to re-acquaint myself with this truck. 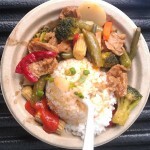 I was encouraged to see that they had a Vegetable and Tofu rice plate on the menu, so I ordered it. It came up very quickly, and I took it back to my car to eat. Unfortunately, it was, sad to say, incredibly bland. 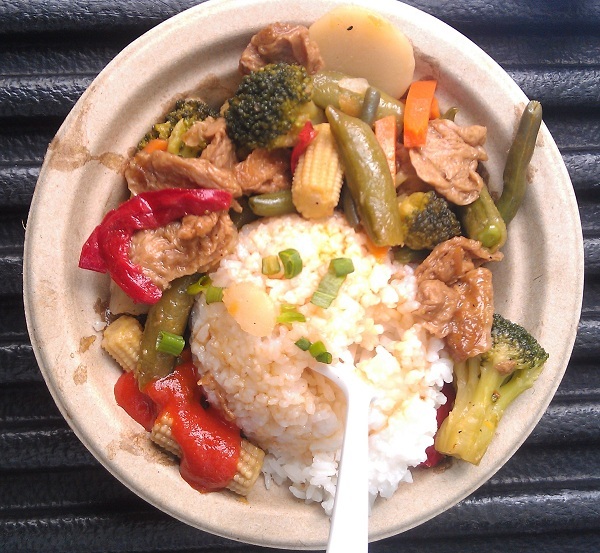 Nice-looking, and the rice was excellent with a tiny dribble of something like teriyaki sauce, but no seasoning on the vegetables or tofu at all. On top of that, it was actually pretty badly overcooked – it had been sitting for a while. The happy part of the lunch was that they keep a bottle of Sriracha sauce out for customers. I came back to the truck, drowned the bowl in sriracha, and it was a whole lot better. So, I’d say, if you’re a carnivore, Rice Rockit might be worth a try. For a veg, however, I’d recommend going somewhere else. On a pretty day, my friend Jon and I found ourselves biking past eBay at lunchti me (amazing coincidence), so I decided to partake from a new (to me) truck called “KaatiFresh.” I have actually come back to this truck a few more times on subsequent rides that just happen to go near eBay at lunchtime. 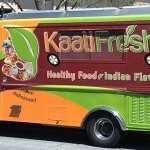 KaatiFresh, good to its name, offers freshly-prepared, delicious Indian food. 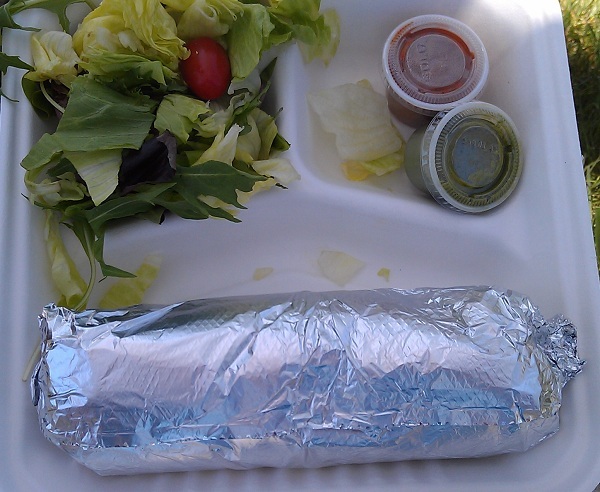 On my first visit, I tried the Aloo Methi Kaati roll – a burrito of sorts, filled with fresh veggies and a delicious potato curry. 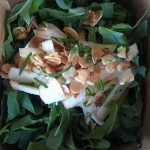 It is also served with some additional salad and two different chutneys. Since that first visit, I have tried some of their other vegetarian rolls and found them to be just as tasty. 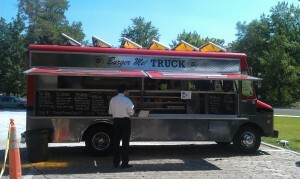 Obviously, I am hooked on this truck and will return again. It wasn’t mealtime, and I wasn’t particularly hungry, but it’s a pretty striking truck and I couldn’t resist going over and giving it a try. 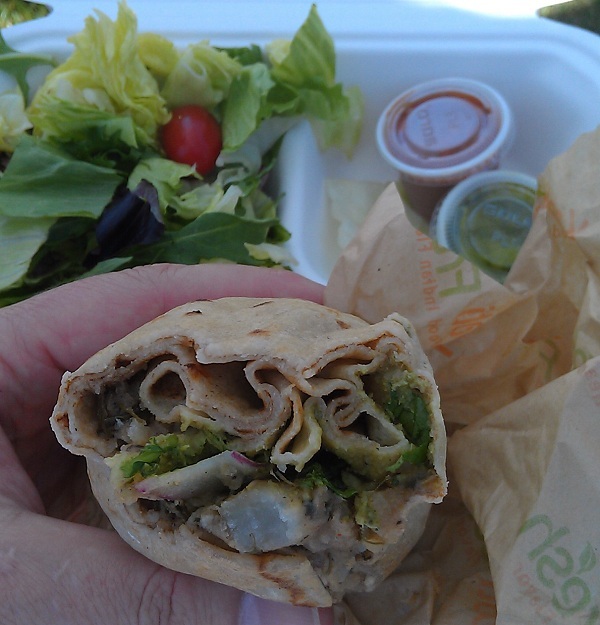 What I received was a mini-burrito, filled with redolent spices and sauce and wrapped in a couple of delicious pieced of flatbread. 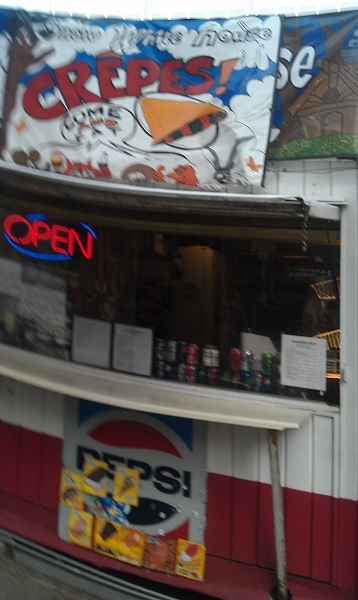 I never did quite understand what it was, so I can’t tell you what to order, but it sure was good. 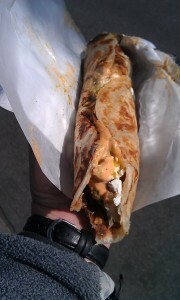 I’m going to have to run down Chutney Mary’s for a more complete review some time soon. 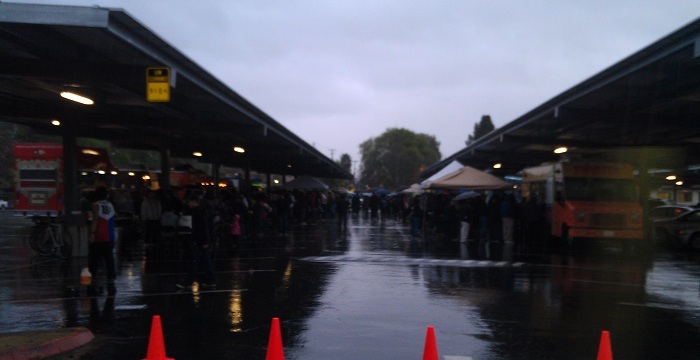 Yet another cold, rainy day, yet another food truck. This was an event to raise money for Piedmont Hills High School, so we went over to see what we could find. 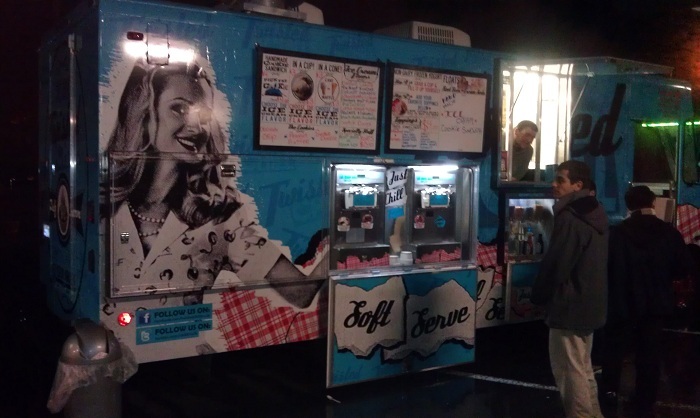 Of particular interest to me was a truck I had not tried before, the Twister Truck. 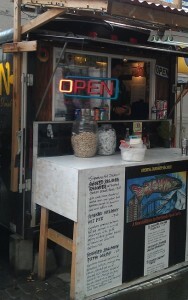 At the time, they were relatively new and I wanted to see their “twisted” take on Mexican food. We got an order of fish tacos and a vegetarian torta. 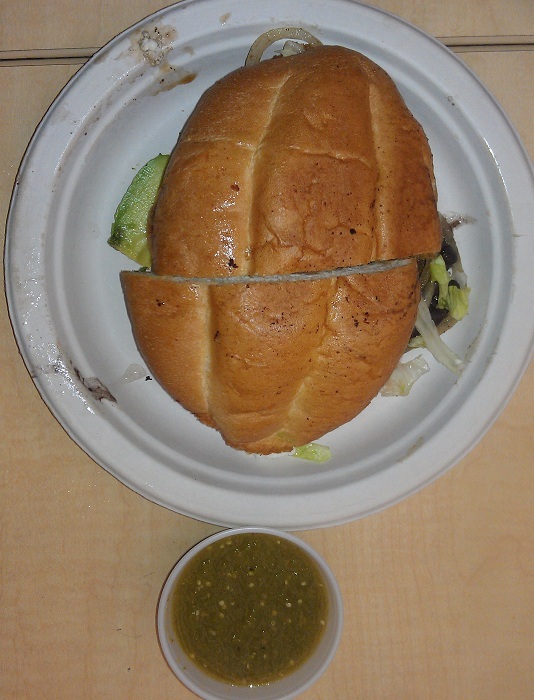 The vegetarian torta was not on the menu, but the chef was willing to give it her best, and the result was terrific. 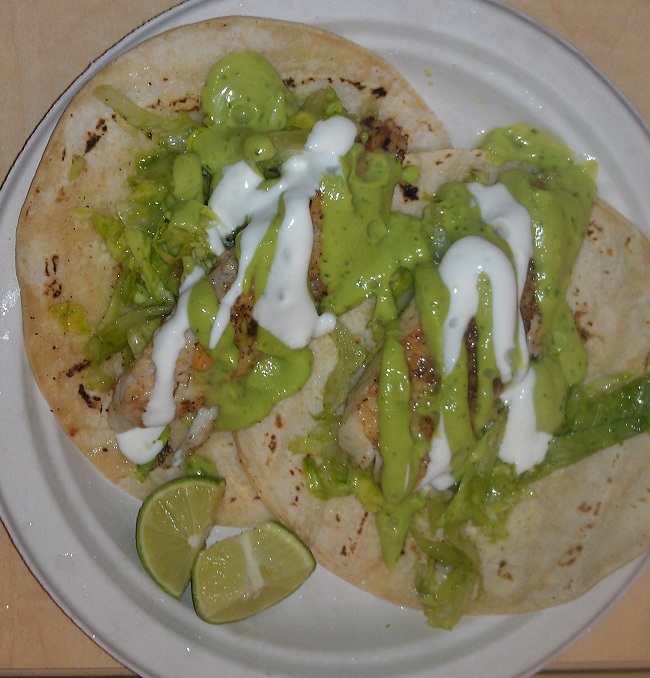 The tacos were also very good, with a delicious and generous salsa on them. Dinner accomplished, we went looking for dessert. In a remarkable twist of fate, the Twisted Chill truck was nearby. 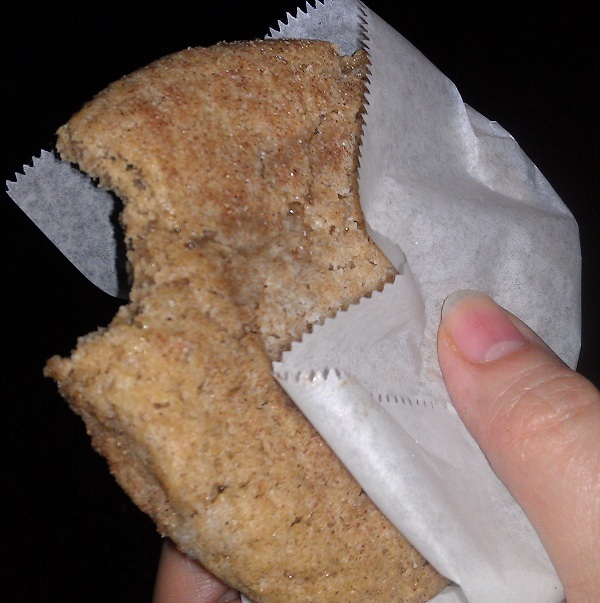 Rather than get one of their enormous ice cream sandwiches, we got a snickerdoodle cookie and a “small” helping of coffee-almond-fudge ice cream, and both were absolutely great. How great? 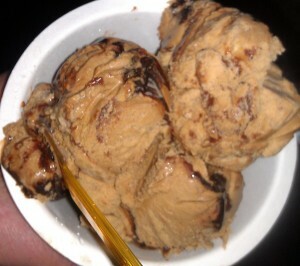 Well, as mentioned, it was a cold, wet night and ice cream seemed like a great idea, even in retrospect. This is a truck I have to get back to some time soon. On a rainy day, I made my way to the Whisk on Wheels truck up at Lockheed to meet up with some folks. I got the Penne (ordered without the chicken, delivered with the chicken…) and had a wonderful meal in the rain in excellent company. 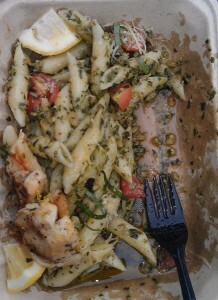 The pasta, as you can see, was served with pesto and tomatoes and LOTS of olive oil. Now, I really like oily pasta, so it was just fine with me, but, if you don’t like it a little oily, you might ask them to tone it down a bit. While we were there (perhaps because I was in such august and influential company) the guys on the truck slid us out a nice order of their new seasoned fries. These were perfectly-fried shoestrings with salt, garlic, and a little lemon on them. We ate a bunch of them, passed them around to the other die-hards out eating in the rain, and everyone enjoyed them thoroughly. Who was I with? These guys: Kyle, Dan, and Bill (the other Bill). If you don’t know these guys, well, in the words of Hamlet, get thee to a Truckery! 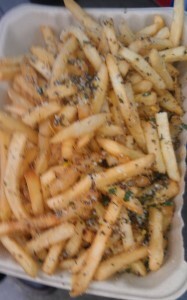 I am still eating at food trucks very occasionally, when I get a chance, and have a backlog of reviews to publish. Unfortunately, the crush of work, a significant injury, and some minor illnesses have conspired to take all of my available time and then some for the last few months. However, I am back upright, I am able to get out of the house occasionally (even by bicycle, even though Jon and I have not restarted our Wednesday rides) and I have the highest hopes of continuing this blog in a more concerted manner. I’m looking for suggestions of new trucks to try – I went out to get a Tikka Byte the other day and saw Porky’s SJ across the street. Please let me know what I should be trying out there – leave me a comment! 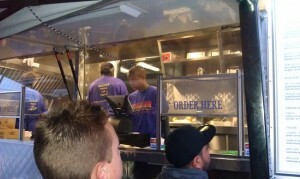 On our last day in Portland, we did manage to get in some “last-minute” food cart meals. 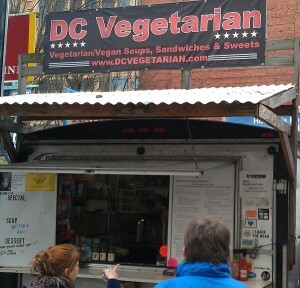 Brett had strongly recommended we try DC Vegetarian, so we made the trek back to the 3rd Street pod. However, on my way there (I took a circuitous route so I could walk on the river), I stopped by The Heart Cart for a free sample. 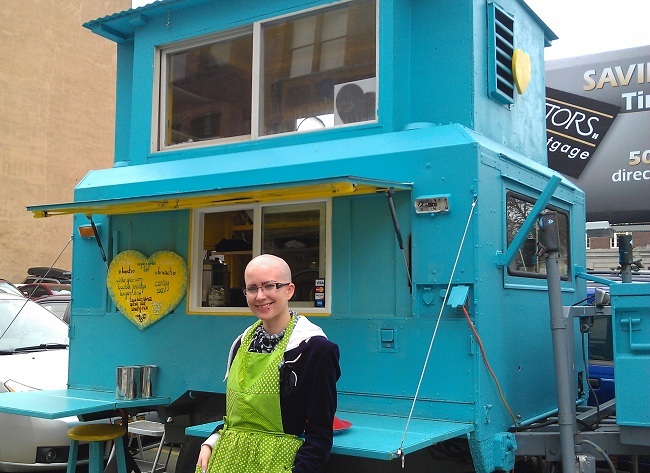 I was fascinated by both the cart (a completely and beautifully refurbished 1950s-era military trailer) and Leah, who is simply so interesting in her appearance that I couldn’t walk past. She generously gave me a sample of her Cajun Bourbon Jambalaya, which I wolfed down gratefully. It wasn’t good enough to deter me from my goal of getting DC Veg, but, if I had another day, I would have set aside a meal for the Heart Cart. 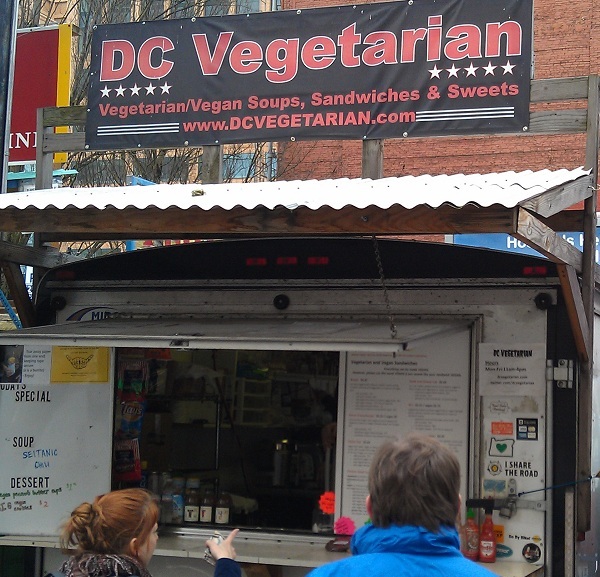 But I faithfully found my way to DC Vegetarian, and ordered a vegetarian “Bacon” Lettuce and Tomato sandwich (the Lovely and Talented LOVES BLTs), along with their “Seitanic” Chili. 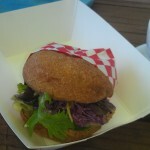 The BLT is available with vegetarian “Bacon” (with egg) or vegan “Bacon” (tempeh) – I chose the vegetarian. 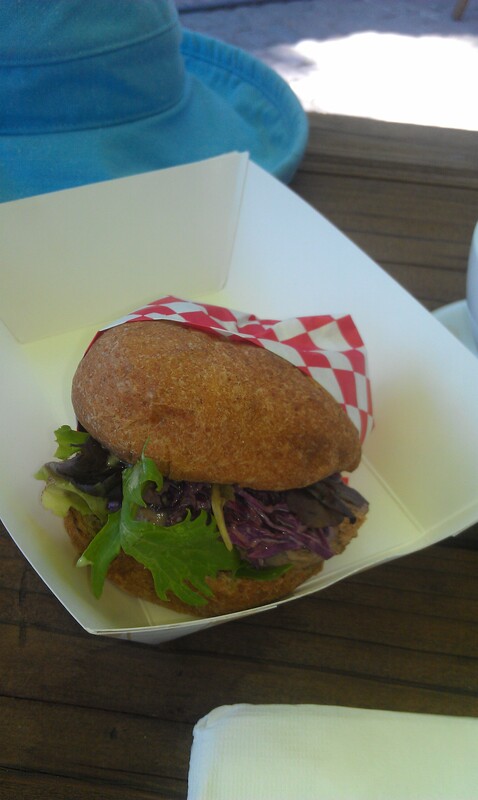 It was a bit odd – it tasted enough like a “real” BLT that I almost felt wrong eating it. The Seitanic chili was everything you could hope for in a veggie chili – it tasted great, was full of different tastes and textures, and it was very filling. 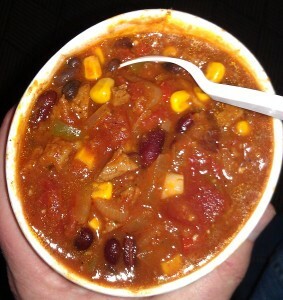 We split both dishes and I ended up finishing off the chili (perhaps because I am a child of seitan). Unfortunately, neither of the pictures of the BLT came out well enough to publish (I know, you’re thinking, “geez, given the low standards, how bad could they be?”), but it was as lovely as it was delicious. 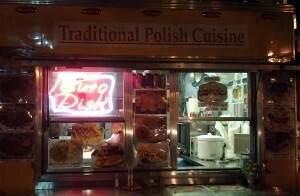 We’re eager to get back to Portland and enjoy more food carts some time. 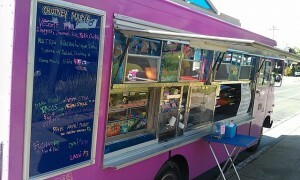 But, for now, it’s back to the Silicon Valley and our own beloved Food Trucks, more of which are opening every week! First off, an apology and a bit of hard-won advice to pass on. 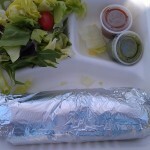 The apology: I am sorry I have not finished this entry and written more about Silicon Valley food trucks lately. The advice: if you sit at a computer and type for a living and/or as a passionate avocation, don’t become a victim of a herniated cervical disk. It really messes with your entire life. OK, that said, we were afoot on an adventure with Brett Burmeister in downtown Portland, following him like so many hungry ducklings. The first place he took us on our tour of Portland food carts was the Dump Truck – a truck at Alder and 9th street converted to a mobile dumpling stand. He got us a nice selection of dumplings, including some without meat for us veggie types – and they were absolutely delicious. They disappeared so quickly I didn’t even get a picture of them, but they looked as good as they tasted, and they tasted REALLY good! The next stop on the tour was a newer cart called “Euro Trash” – conveniently just down the street from one of the carts mentioned in the previous post, “Euro Dish.” Brett explained that Euro Trash is trying to bring some traditional European treats to Portland, but with some modern flair. As an example, he treated us to an order of “Fish Heads” – actually, served with the rest of the fish, nice little white Anchovies, lightly coated and deep-fried. Both the heads and the bodies were delicious, served with a light dipping sauce that accentuated but didn’t hide the natural flavor of these wonderful little morsels. 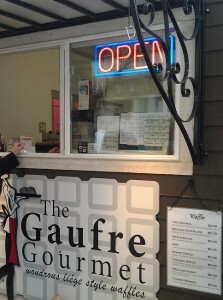 After that, we walked to almost the opposite corner of the block for “dessert” at Gaufre Gourmet. Had you ever heard of Liege-style Belgian waffles? 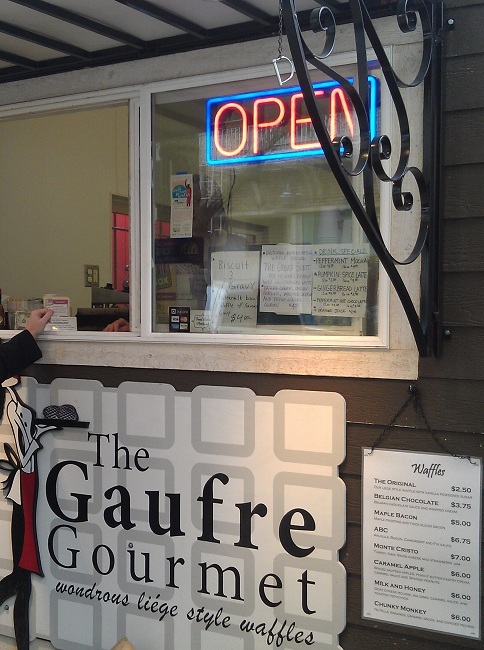 We hadn’t either, but we got a quick education at Gaufre. For instance, they’re made from a dough instead of a batter, and the dough is infused with “pearl sugar.” It seems there’s always a line there, and it’s easy to understand why – once again, they disappeared way too fast for a picture. 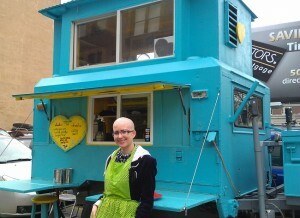 We then walked down to the 3rd street cart pod for some more sightseeing and deliciousness. We were introduced to Roger at Salmon Fusion on 3rd Street. This is a fairly new cart, and he is bringing fresh salmon down from Alaska, smoking it himself, and serving it in a number of amazing and wonderful dishes, from the traditional salmon-and-cream-cheese bagel to an amazing smoked salmon chowder. 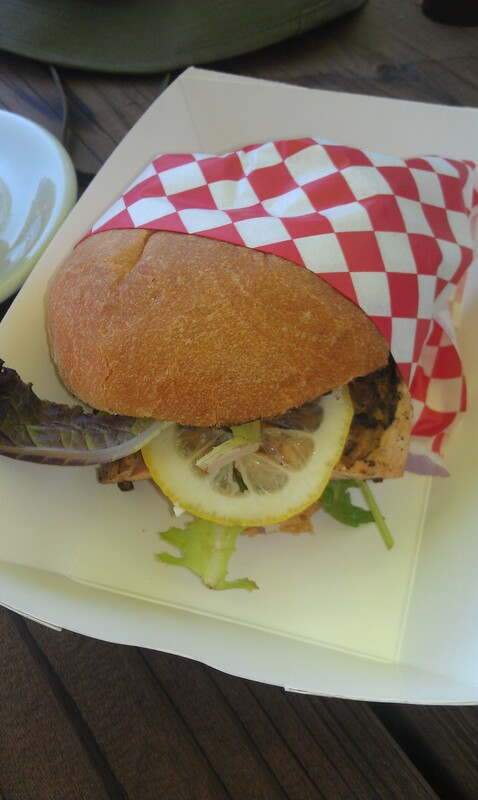 We got to sample a little of Salmon Fusion’s fare, but the tour was over, it was lunchtime, and I was still just a bit peckish. On our way to Salmon Fusion we had passed some trucks, and I just had a hankering for what one of them was dishing up. 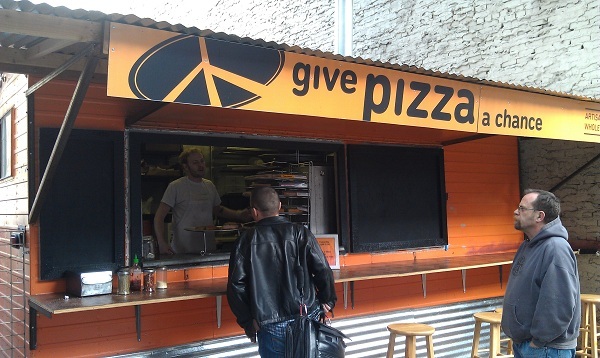 So, after bidding Brett a fond farewell (and a promise to give him a tour of our food trucks when he comes down our way), we went over to Give Pizza a Chance. Now, I can eat pizza any time of the day or night, multiple times a day, and in almost any conditions. The prospect of a nice fresh slice from a cart on a rainy day was almost more than I could handle. But we managed to put away a couple of their gourmet, New York-style slices, with toppings ranging from the usual to the very unusual (mine was carmelized onion and gorgonzola – yum!). Over the next couple of days, we wandered the city, saw the sights, and had a number of excellent meals, both at carts and in regular restaurants. I celebrated my birthday at the Portland City Grill, which, on the 30th story of the tallest building in downtown Portland, is about as far from a food cart as you can get. 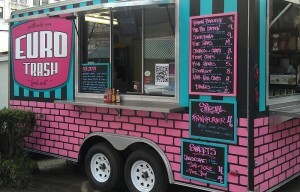 We’ll finish this up with some more Portland food carts, however, before bidding the Rose City farewell. 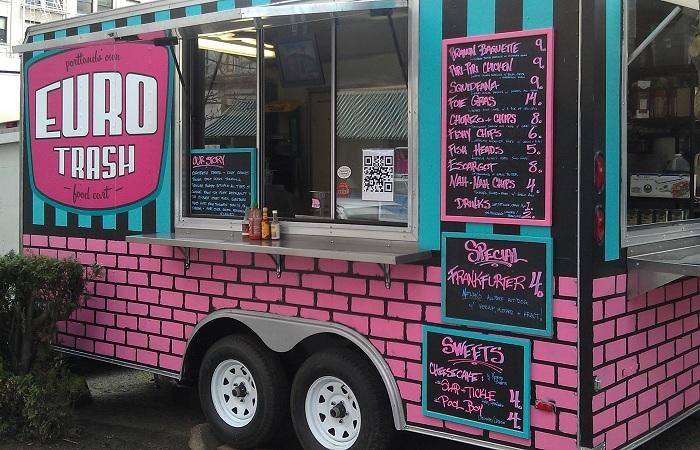 Portland is food cart heaven, Mecca, and Valhalla, all rolled into one. So, when the Lovely and Talented had a week off work for a much-deserved vacation, where else could I take her? 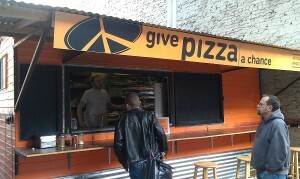 We arrived in Portland about lunchtime, and we took off almost immediately for the PSU Pod of food carts. In Portland, the carts usually stay in one place – parking lot operators rent out spaces at the edges of the lots to food carts. They have installed electrical connections and, in some cases, plumbing facilities, resulting in “pods” around these parking lots. The presence of many carts at each of these pods attracts crowds, so the carts don’t have to move around to find customers. The PSU pod is near Portland State University and has several great carts to choose from. 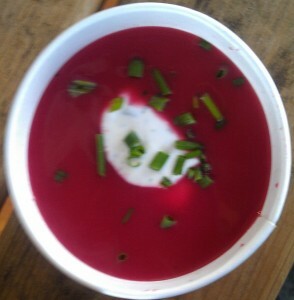 The L&T had really wanted to try the Portland Soup Company, so we ran over there. We had one of the most delicious meals I have ever enjoyed: an amazing fresh beet soup with dill sour cream and an arugula salad with almonds, apples, and brie. Served with fresh bread, it was incredibly good on a crisp Oregon day. They had one fresh chocolate chip cookie left, and we finished our meal with that in all its soft, gooey, chocolatiness. It disappeared too quickly for a picture – this happened a lot on this trip. We had a few hours to rest and wander around, then we ambled over to the Alder St. pod between 9th and 10th streets to see who was available for dinner. 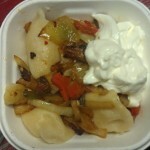 EuroDish was one of the carts open late, with lovely pierogis. They had potato and cheese, veggie, and meat, so we had an order of six: three potato and cheese and three veggies. 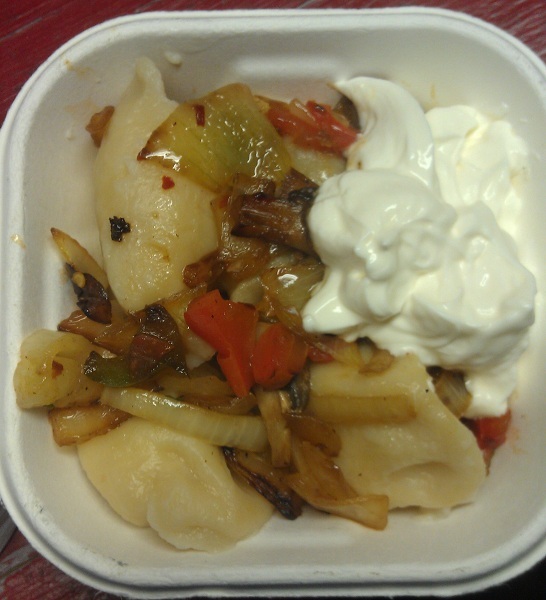 They were boiled up fresh and served with some delicious sauteed veggies and a dollop of sour cream. We gobbled them up like we hadn’t eaten all day- they were terrific. Afterward, we looked for dessert possibilities and we found the Snow White House Cart with a huge variety of sweet and savory crepes available. 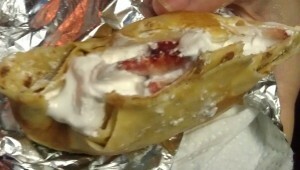 We ordered a strawberry chantilly crepe with fresh strawberries and whipped cream. This, unfortunately, is where things went a bit wrong. As we stood waiting for our crepe, we took a look inside the cart and realized that the blinds on the right side of the cart were covered in at least half an inch of dust and grime. Looking at that made us uneasy, to say the least – we were thinking seriously about just walking away. She is completely off her rocker. Not that “Oh, she’s so crazy!” kinda way, either. Use caution. While we were eating, we got a call that would inform a chunk of the next day’s agenda. Bill @foodtrucknerd had suggested I get in touch with Brett Burmeister @pdxfoodcarts, who is making a business of following, commenting on, advising, and helping with the HUNDREDS of food carts, trailers, and trucks in the Portland area. 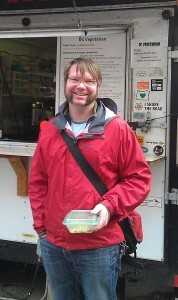 Brett called to invite us along on his food cart walking tour in downtown Portland the following day. 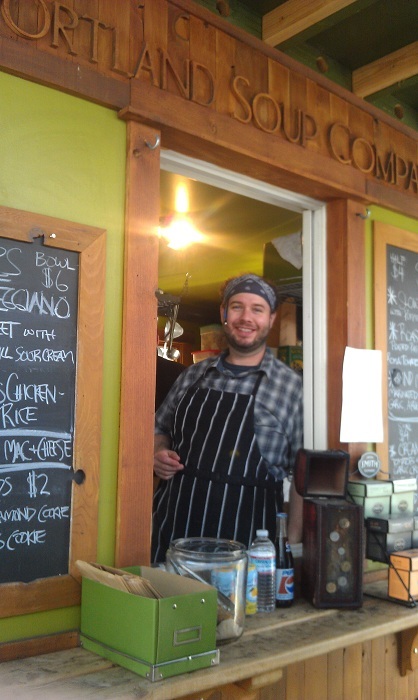 Looking forward to a good hour’s walk and Brett’s expertise in the history and current state of food carts, we felt the adventure was afoot – literally!